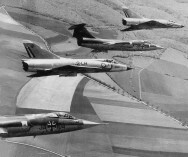 Italian Air Force 154 Gruppo (part of 6 Aerobrigata) flying the F-104G, based at Ghedi, exchanged with the USAFE 9 TFS/49 TFW at Spangdahlem, flying the Republic F-105D aircraft. It is unknown if it was a one or two way exchange. 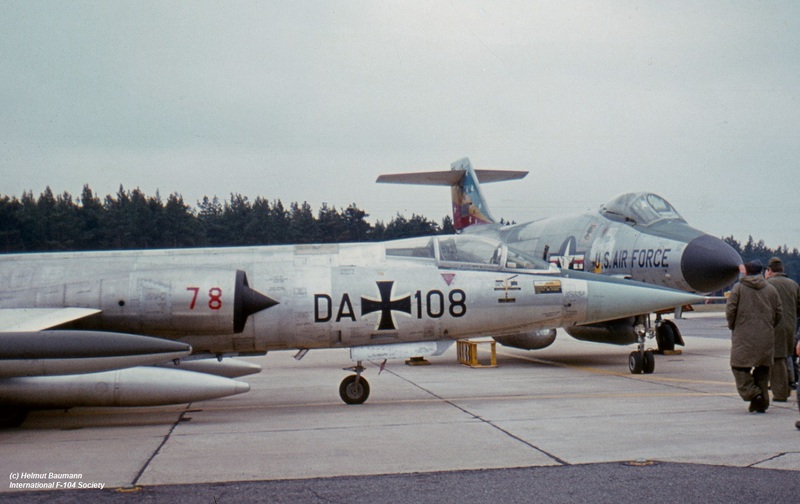 German Air Force JBG31 (2nd Staffel) flying the F-104G, based at Norvenich, exchanged with the USAFE 78th TFS/81 TFW at Woodbridge flying the Mc Donnell F-101A and C Voodoo. At least bare metal F-104G DA+242 has been noticed during the exchange when an open house was held at Woodbridge. It was a two-way shifted exchange. JaboG 31 stayed in Woodbridge from 16 March until 25 March 1965, while 78th Sqn. stayed in Nörvenich from 22 April to 29 April 1965. 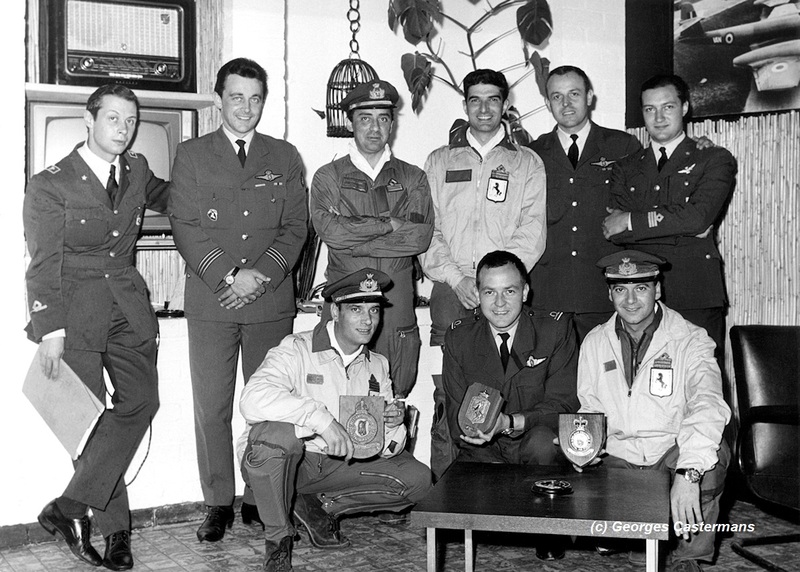 Together with 21 technicians four pilots flew to the Woodbridge AFB flying missions together with the F-101s over the UK. 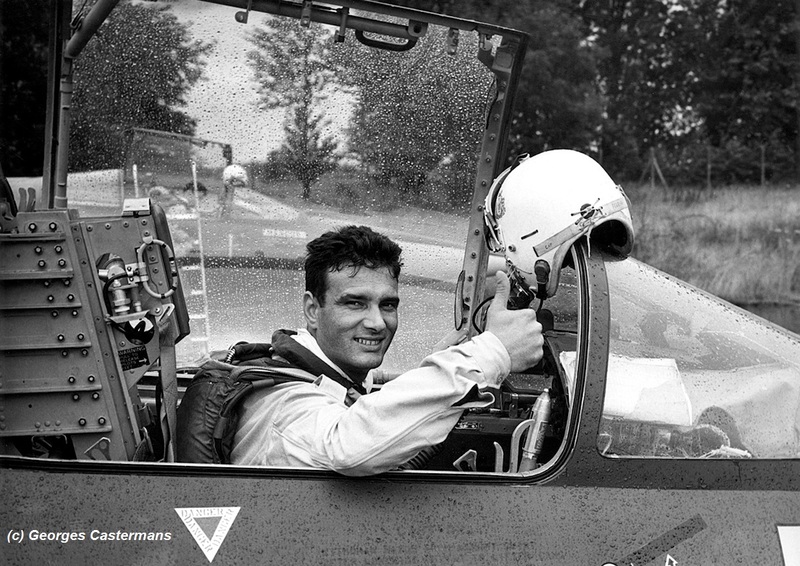 The pilots were Oblt Peter Tau, Hptm Wolfgang Willam, Lt Klaus Forker and Oblt Horst Völter. 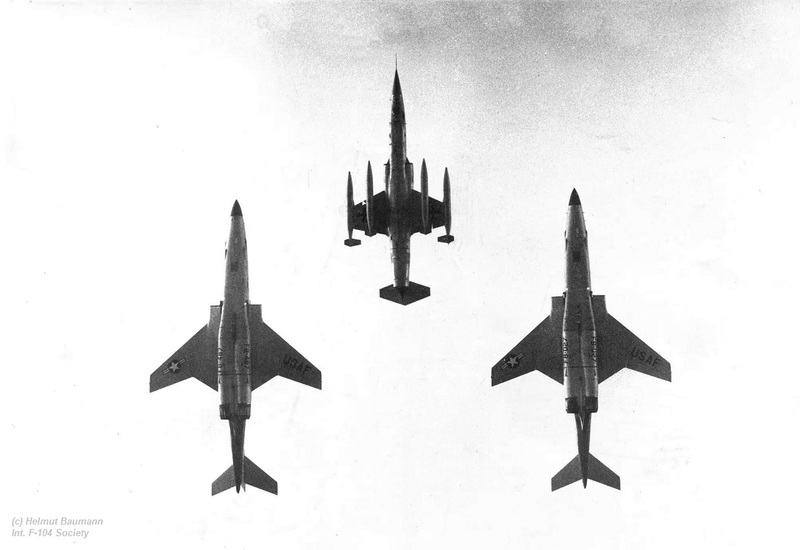 Beneath a photo taken at Norvenich showing F-104G DA+116 (cn 2065) flying over the airbase with two F-101C Voodoos 54-1487 and 56-0027. 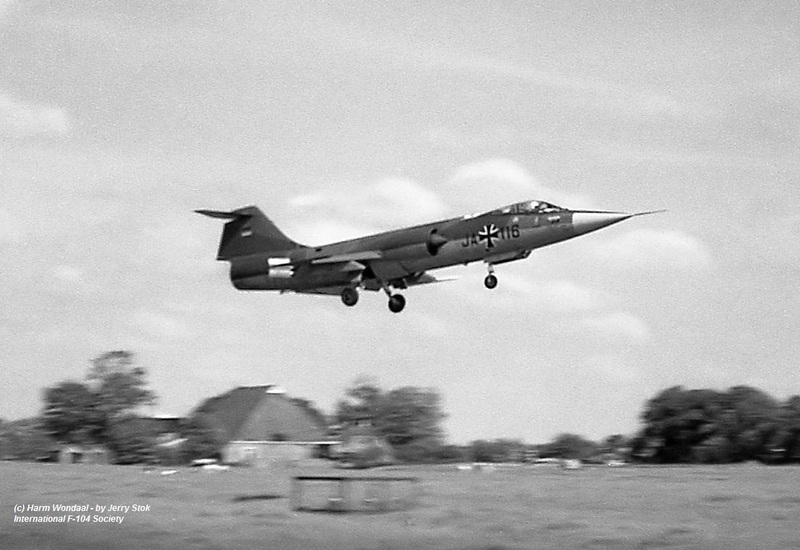 Also two F-101A aircraft were seen at Norvenich (54-1455 and 54-1477). Another aircraft seen at Woodbridge was DA+108 (cn 7017). (Photo thanks to Helmut Baumann). Please note the red zapped "78" on the Starfighter inlet, painted by the 78th TFS personnel. 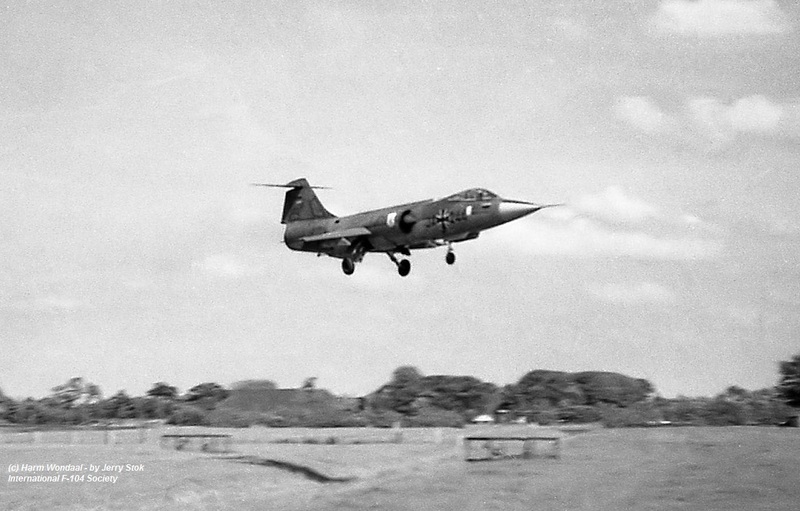 The Belgium Air Force 1 Wing - 349 Squadron operating the F-104G at Beauvechain exchanged this period with the USAFE 494 TFS/48 TFW operating the F-100D at Lakenheath. It is unknown if it was a 1 or 2 way exchange. Luftwaffe JG71 based at Wittmundhafen held its very first squadron exchange. It participated in a 2-way exchange with French Air Force Mirage IIIC aircraft based at Dijon. It looks like EC 3/2 "Alsace" hosted JG 71 in Dijon, while JG 71 hosted EC 1/2 "Cigognes" in Wittmundhafen. 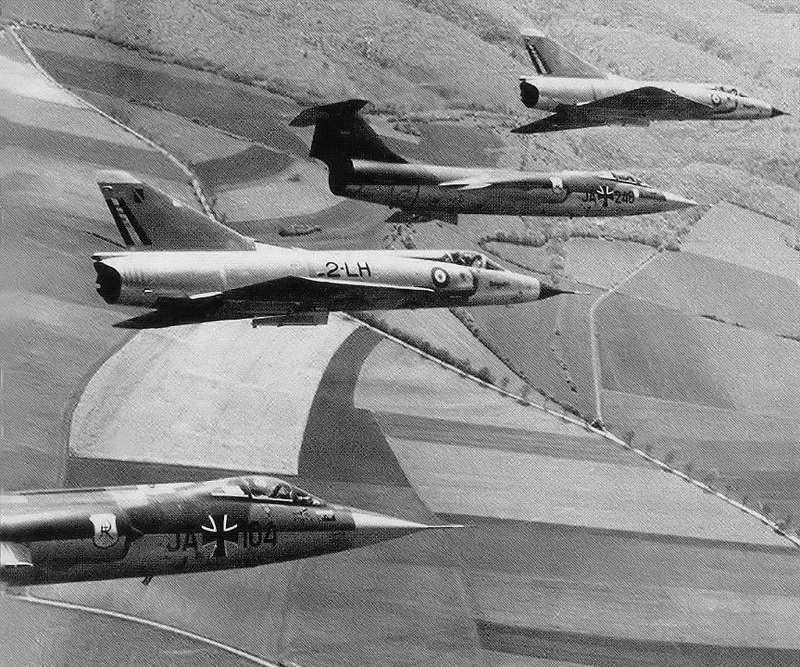 Four Mirages flew to Germany while four Starfighters flew to France being F-104Gs from both staffels (JA+101, JA+104, JA+246 and JA+248). 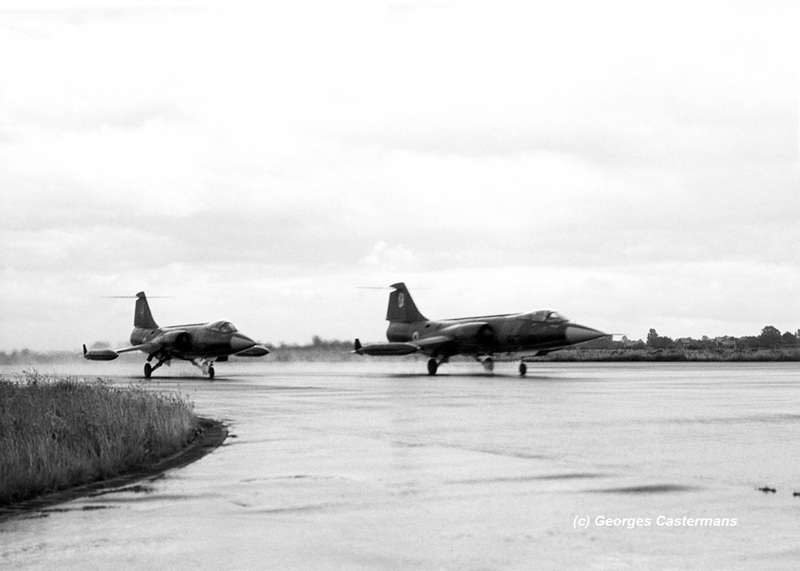 Beneath a photo taken from a Mirage/Starfighter formation over France. Italian Air Force 9 Gruppo (part of 4 Aerobrigata) from Grosseto exchanged with Starfighters from Beauvechain based 1 Wing – 350 Squadron. It was a two way exchange divided over two periods. First in June the 350 Squadron flew with four Starfighters to Italy, lead by Capt Rene Blanchard, and in July four Italian Starfighters flew to Belgium in return together with support by a C-119. The Belgium aircraft flew at Cameri due to works on runway at the 9 Gruppo homebase Grosseto. Sadly we do not know which aircraft flew to Italy. Norwegian Air Force 331 Skv at Bodo exchanged with the German Air Force JBG33, stationed at Buchel. It was a shifted 2-way exchange were the Norwegians flew to Buchel in June and JBG 33 to Rygge later in the year in July (Not Bodo). 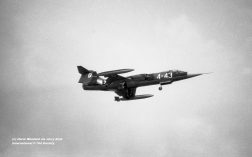 The four Norwegian Starfighters seen at Buchel were: FN-N (62-12238), FN-P (62-12233), FN-T (62-12232) and FN-X (62-12240). Ex Norwegian pilot Rolf Mangset remembered this exchange. "We departed Bødø on the Monday 14th of June 1965 with 4 (R)F-104G aircraft, and eight pilots. 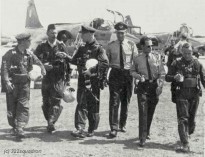 Crew chiefs and other personnel by C-119. We flew mainly low level missions (At 500 feet AGL) from Büchel into France and return. Typically one and a half hour missions. The JBG33 did a great job of entertaining us. Trip to Bernkastel in the Mosel valley for a visit of a winery tasting the Riesling. Also a trip to Koblenz were the Mosel meets Der Rhein was arranged. During the week end we flew to Lechfeld in Bavaria where we stayed while enjoying München on Saturday and Sunday. Monday return to Büchel. We had more pilots than airplanes, so they got a ride with Luftwaffe. Piaggio P-149d, and TF-104G aircraft. On Wednesday 23d we returned to Bodo via Aalborg in Denmark". The Dutch Air Force 306 Squadron from Twenthe AFB flying the F-104G and RF-104G Starfighter exchanged with the Norwegian 331 Skv based at Bodo. It was a two-way shifted exchange. 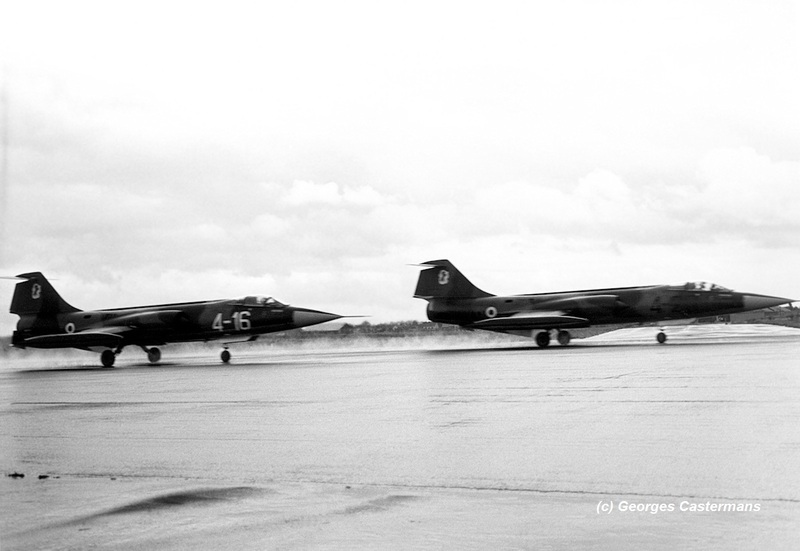 First four Dutch RF-104G were at Bodo in June and later on in October four Norwegian Starfighters went to Twenthe. 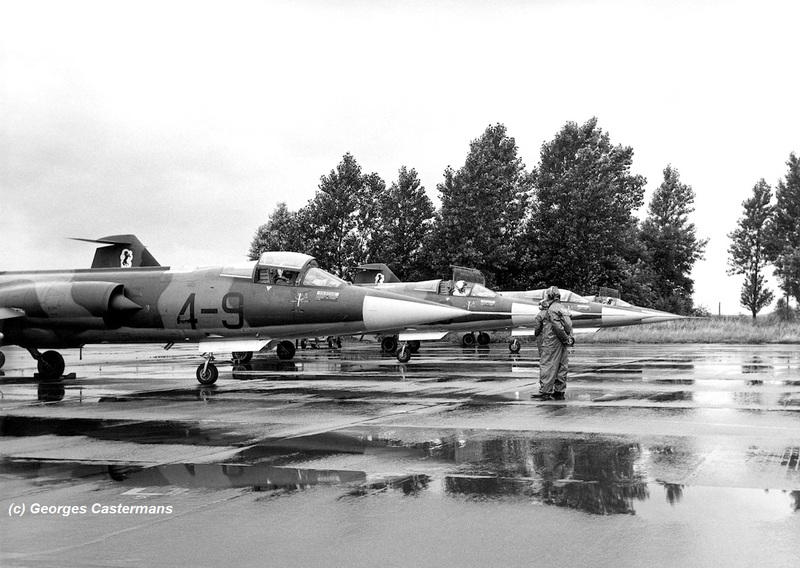 Among the Starfighters which flew to Norway on June 14th were RF-104G D-8101, D-8119, D-8133 and D-8141. Aircraft D-8133 flew back to Volkel already June 21st. Luftwaffe JG71 based at Wittmundhafen, operating the F-104G. was reported to have exchanged with Turkish Starfighters from 4 AJU based at Murted. The Turkish aircraft only flew to Germany so it was a one-way exchange. We have doubts about this exchange because there is no photographic evidence that this really took place. Since it was one way it also could be a deployment. 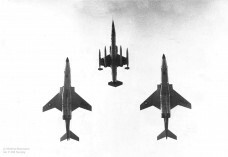 At that time Murted was the homebase of 141 FILO and 144 FILO, both with F-104G. 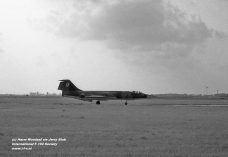 Dutch Air Force 322 Squadron based at Leeuwarden AFB exchanged with Luftwaffe JG71 (711 Staffel) based at Wittmundhafen, both operating the F-104G. It was a 2-way exchange. Participating F-104Gs known from JG71 were: JA+116, JA+236, JA+239 and JA+244. The Dutch aircraft travelling to Germany have not been identified but at least three of them were camouflaged Fokker aircraft. 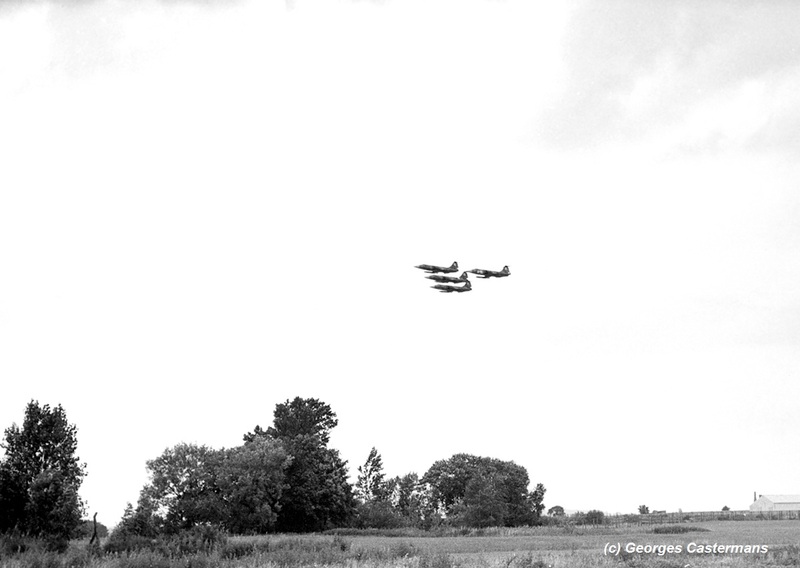 The Dutch aircraft arrived at Wittmundhafen on 21st June in "plumcake" formation at 12:00 PM. For ten days several missions were flown during days and nights together with the Germans. Mainly they flew low-level navigation trips, straight-and-level without any high-g manouvres. 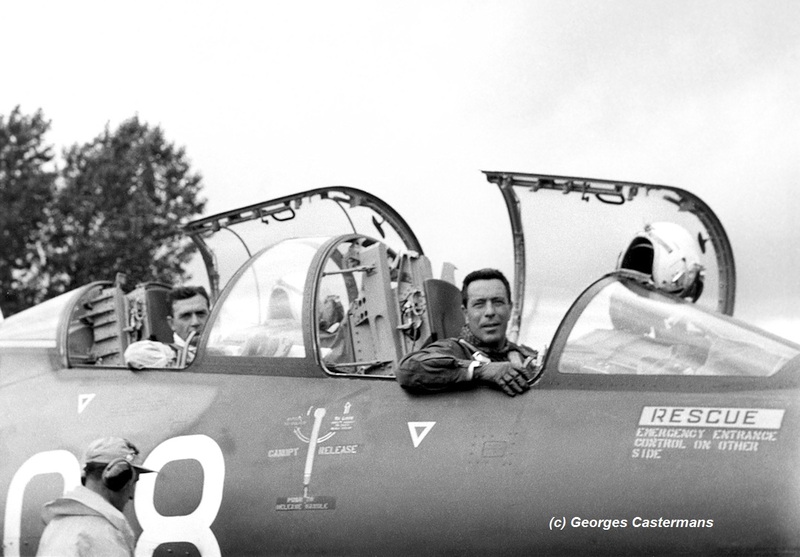 Two pilots (Jan Oldenburger and Henkie van der Wilk) were getting used by the German circumstances and flew one day straight low-level to Memmingen in Southern Germany. They discovered a nice atmosphere at Memmingen and decided to stay overnight. They send a telegram to Wittmundhafen "Temperature 34 degrees, we will depart back to Wittmundhafen tommorrow at 08:30 local". Short afterwards the pilots were urged to come back to Wittmundhafen as soon as possible!! They arrived back the same day at 05:30 PM..... On the photo beneath (thanks to 322 Squadron) you see (left-right) pilots van der Wilk, Otten, Groeneveld, two Germans and then pilot Tijl just after arrival at Wittmundhafen. The wonderful landing photos were taken at Leeuwarden by Harm Wondaal (thanks to Jerry Stok). Norwegian Air Force 331 Skv at Bodo exchanged with the German Air Force JBG33, stationed at Buchel. It was a shifted 2-way exchange were the Norwegians flew to Buchel already in June and JBG 33 to Rygge later in the year in July (Not Bodo). Sadly the serials of the German Starfighters at Rygge are unknown. Italian Air Force 9 Gruppo (part of 4 Aerobrigata) from Grosseto exchanged with Starfighters from Beauvechain based 1 Wing – 350 Squadron. It was a two way exchange divided over two periods. First in June the 350 Squadron flew with four Starfighters to Italy, and in July four Italian Starfighters (and six pilots) flew to Belgium in return together with support by a C-119. When the Italians were in Belgium, the 4 Aerobrigata vice-commander Col. Francesco Terzani (4 Aerobrigata commander by that time was Giorgio Bertolaso) visited Beauvechain in a brand new, just delivered, TF-104G MM54234 code 20-8. In the backseat he brought 9 Gruppo commander Major Lorenzo Pasculli. On June 15th the 350 Squadron commander Major Georges Castermans payed a visit to Cameri (in FX35) together with 1st Wing NSO Marcel Legrand. 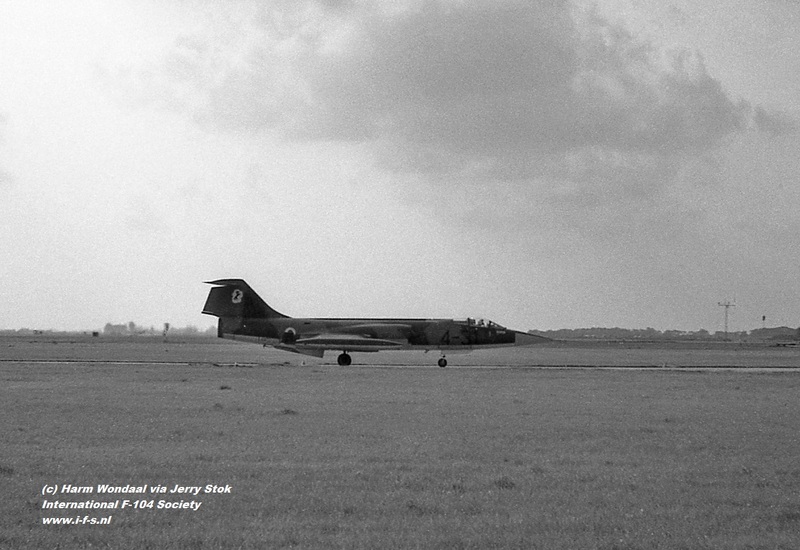 Participating Italian aircraft seen in Belgium were F-104G's MM6515/4-16, MM6518/4-20, MM6xxx/4-9 and an unknown aircraft. The MM6515 was the only one with the newer white serials. 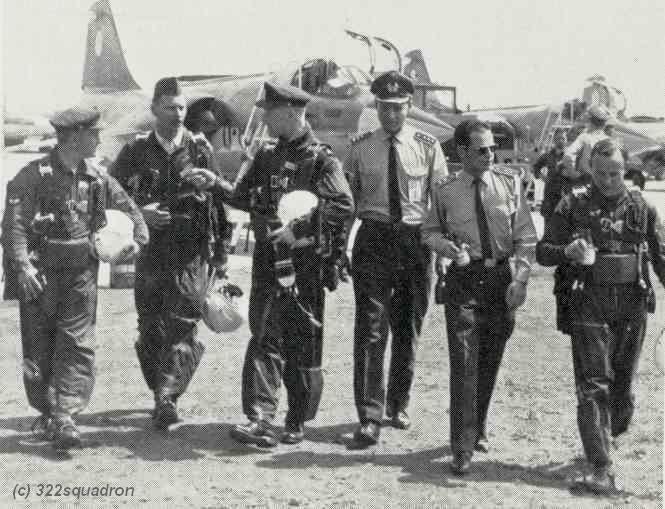 (All photos beneath and information thanks to Georges Castermans) On top the Italian pilots being from left to right Capt. Amos Ghisoni, Capt Vittorio De Angelis (leader of the Italian group), Capt. 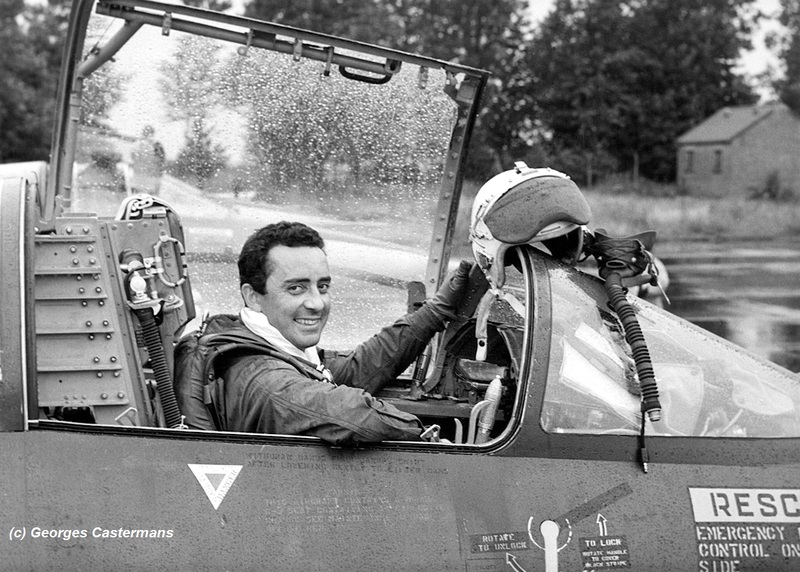 Ferdinando Sguerri, Capt Ferruccio Ferrari and inside the 2-seater 4 Aerobrigata vice commander Francesco Terzani (front seat) and 9 Gruppo commander Major Lorenzo Pasculli (rear seat). 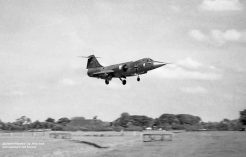 Luftwaffe JG71 based at Wittmundhafen was reported to have exchanged with English Lightning interceptors from 111 Squadron based at Wattisham. which looks to be a one-way exchange could also have been a deployment for an exercise. We still would like to have some confirmation. 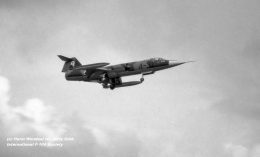 Dutch Air Force 323 Squadron based at Leeuwarden AFB exchanged with the Italian 10 Gruppo (part of 4 Aerobrigata) based at Grazzanise early September, both operating the F-104G Starfighter. It was a two-way exchange. 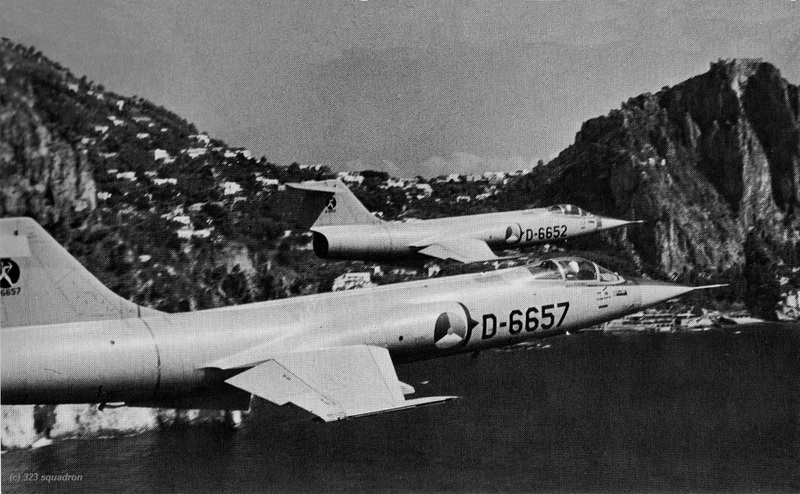 Of the four participating Italian Starfighters only three were identified being MM6569/4-31, MM6563/4-35 and MM6571/4-43. On the 4th of August aircraft MM6558/4-40 and MM6569/4-31 made a pre-visit to Leeuwarden. During this period four Dutch Starfighters flew to Grazzanise together with one T-33, of which two were identified as D-6652 and D-6657). 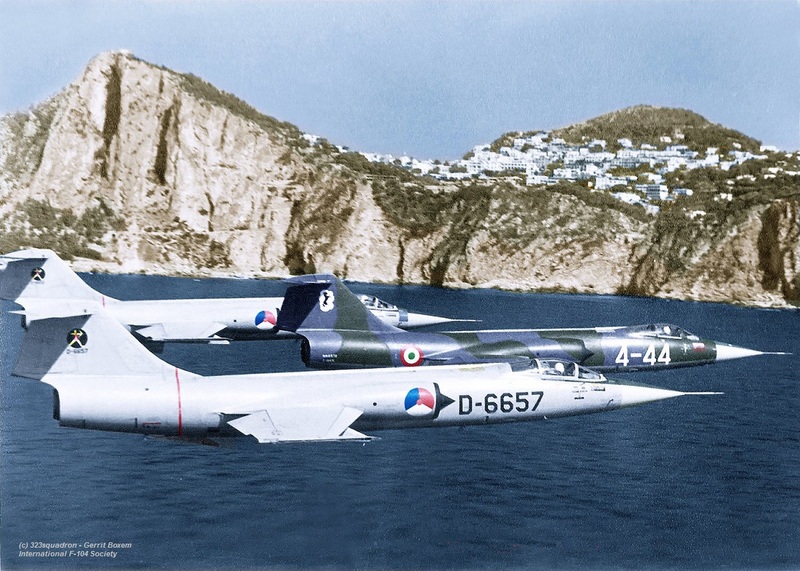 The photos showing Dutch F-104Gs in clean configuration over the Capri mountains together with Italian F-104G MM6572 code 4-44. (The 2nd photo was colored thanks to Gerrit Boxem) thanks to 323 Squadron. Also 4 nice photos taken at Leeuwarden on September 6th (taken by Harm Wondaal, via Jerry Stok) showing three of the four participating aircraft in Holland. 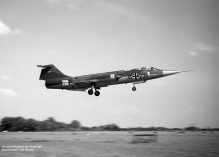 German Air Force JG74, operating the F-104G at Neuburg exchanged this period with the USAFE 525 FIS/86 AD based at Bitburg. The Americans flew six F-102A Delta Daggers to Neuburg . Transport was arranged by two Luftwaffe Noratlas aircraft. 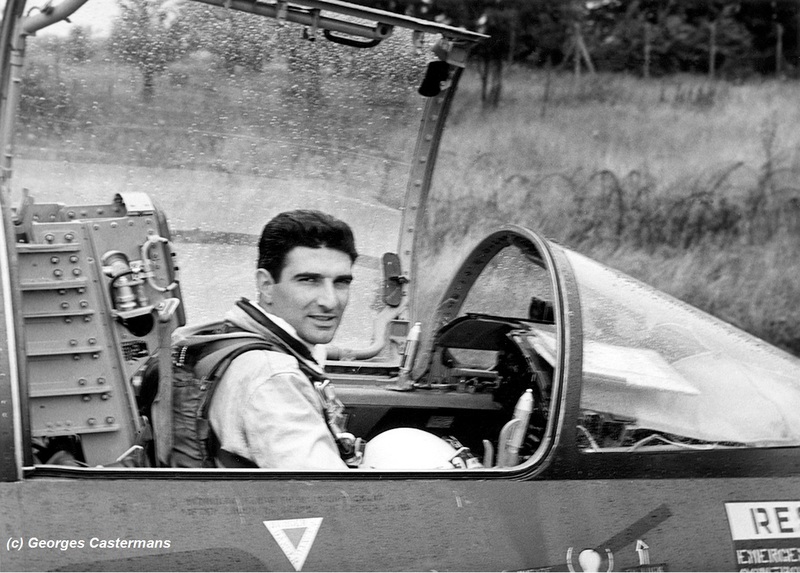 JG74 flew a mix of F-104G and F-86K aircraft by that time. 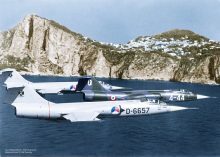 The Dutch Air Force 306 Squadron from Twenthe AFB flying the F-104G and RF-104G Starfighter exchanged with the Norwegian 331 Skv based at Bodo. It was a two-way shifted exchange. 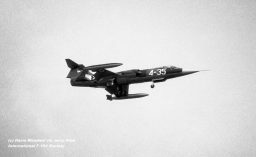 First four Dutch RF-104G were at Bodo in June and lateron in October four Norwegian Starfighters went to Twenthe. These were: 61-2625/FN-K, 61-2633/FN-U, 62-12237/FN-A and 62-12240/FN-X. All aircraft departed October 28th, making a fuelstop at Rygge. Aircraft FN-K was flown by Capt Olaf Aspen. 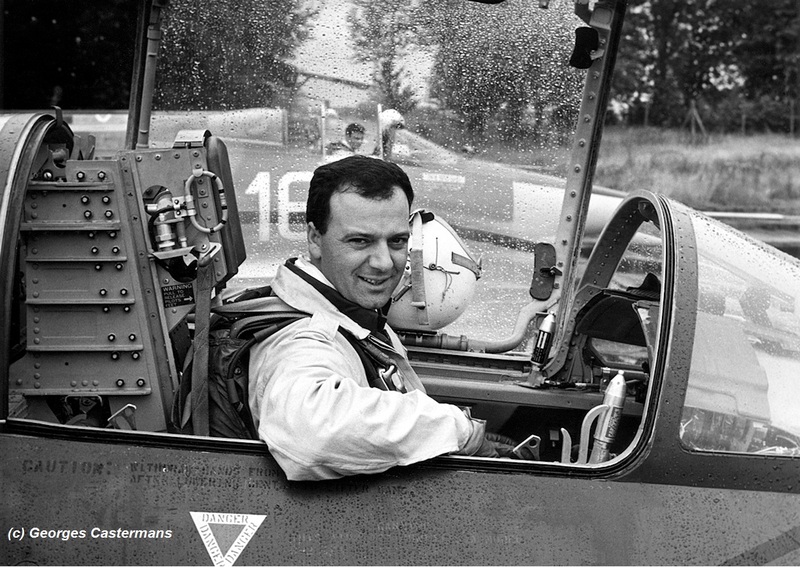 The other pilots were squadron Commander Major Magne Tobias Sörensen, Lt. Per Kristiansen and Lt. Arne Pedersen. Flighttime from Twenthe to Rygge was 1:35h and from Rygge back to Bodo was 1:40h. The exchange was supported by a Norwegian Air Force C-119J Flying Boxcar. Royal Air Force 5 Squadron based at Geilenkirchen, Germany, flying the Javelin FAW.9 fighter aircraft exchanged with the Italian 21 Gruppo Autonomo based at Cameri. It was a 1 or 2 way exchange.